Google launches a new video of Google Glass that showing its features and what you can do with the help of it. View this video to know more about this wonderful wearable gadget. This stylish smartphone is launched by Vertu who is the leading maker of luxury phones. You will be surprised to know the cost of this smartphone as Android is a free operating system. Vertu Ti is the first Android smartphone of Vertu with a cost of US $9,600. Vertu Ti handmade from 184 parts in England by a single craftsman, every Vertu Ti is signed by the craftsman. This beautiful smartphone will be available in four colors Titanium black leather (USD $9,600), Titanium pure black (USD $11,500), Titanium black alligator (USD $12,800) and black PVD Titanium red gold mixed metals (USD $19,900). There is one unsatisfactory thing about a smart-phone. Because it has a touch screen, it doesn’t provide the feelings of button and is uncomfortable to write something. This Bubble Phone will solve this problem. This smart-phone with a transparent display has different front and back sides. There is screen that is the same with a normal smart-phone in the front side and the keypad is prominent in the back side. You can turn it to use, as necessary. Takara Tomy has unveiled a new robot toy that cleans your smartphone or tablet screen. Japanese company TakaraTomy developed a this tiny robot that can clean the screen of your smartphone, iPad, iPod or laptop in just 4 minutes. It diligently runs and sweeps by the surface of your tablet, removing fingerprints and other things stuck on your tablet’s screen. No need to worry about it falling off the tablet, as it is equipped with simple and standard sensors that help it detect the edges of the unit. The Automee measures in at 67x73x38mm and weighs 82 grams. It’s powered by a single AA battery that can last up to three hours. Automee S will come in a variety of colors, and is slated to launch in Japan on March 28 for approximately $17. Finally Google has launched most awaited wireless charger (Qi inductive charger) for its Nexus 4 phone. You can buy this wireless charging orb from the google Play store. it can charge your Nexus 4 phone in approximately 4 hrs. This wireless Qi inductive charger will cost you $59.99 only excluding shipping and tax. Its shipping time is less than one week. Where to buy: You can buy this wonderful charger from Google Play store. If you have been bored with your smartphone then you should buy Neptune Pine, a smartwatch launched by Neptune Computer Inc.
Who is killing the newspaper industry, Websites or people? Today most of the top newspapers are struggling for their survival. Those were the days when people started their day by reading newspaper with a cup of a tea. Now what has changed that this industry is struggling to survive. 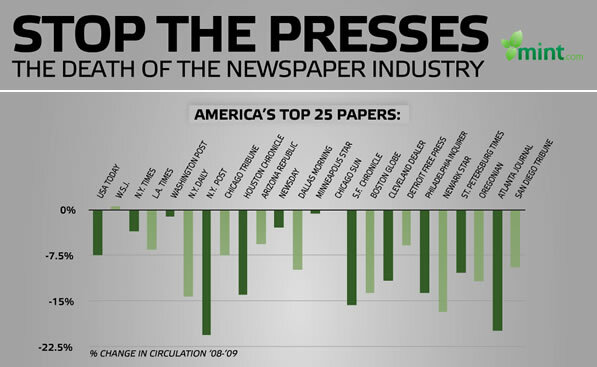 In this picture you can see that all top 25 newspapers of America are performing so poor. What are the reasons behind it. Is it digital age or this industry unable to keep up with the pace changing lifestyle of people. The social-networking giant announced the acquisition, which will give Twitter the ability to better understand how users mix social media and TV. Read this article by Daniel Terdiman on CNET News. Today Twitter confirms that it has bought Bluefin Labs which has specialization in social TV analytics. Now Twitter will get the ability to analyse its users behaviour how they mix social media and TV. The controversial Super Bowl commercial that shows a mismatched couple in a deep kiss gets the company a record amount of new customers and overall sales. Read this article by Dara Kerr on CNET News. Apparently advertising really works. Well, at least if it contains a nerdy geek making out with a blonde model. The controversial Super Bowl commercial that shows a mismatched couple in a deep kiss gets the company a record amount of new customers and overall sales.